One thing I've come to realise is how good Thai joints are with their quirky and pun-tastic restaurant names. Thaina Box is a cosy yet modern-looking Thai Eatery on the Burwood Road strip. The place is not that big but I enjoyed the atmosphere it created - the open-styled kitchen, black and white paintings, dim lighting and wooden tables with leather clad seats made it contemporary yet warm. How awesome is this painting? Love it! 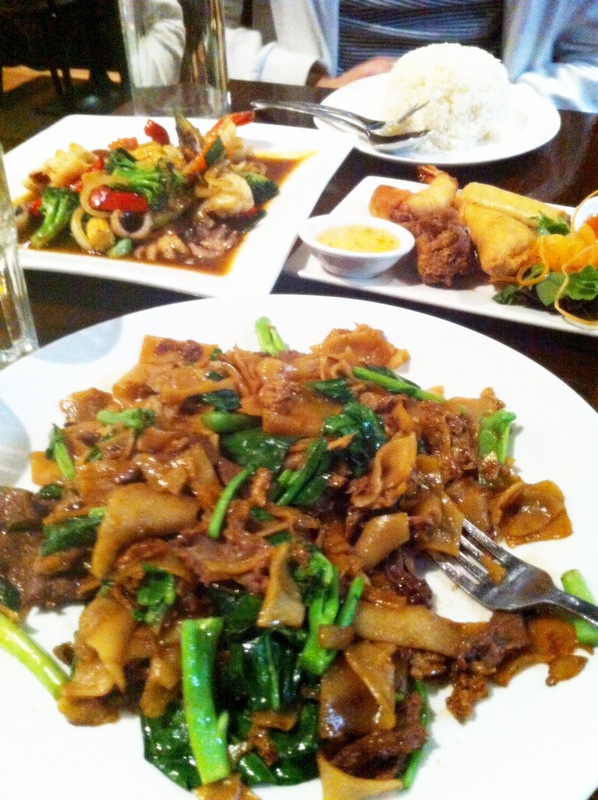 Too bad I took a blurry photo :P Was way too hungry that night - thank god Thai food comes quick! Thaina Box has a simple 3-Step Design Your Own Dish system which involves the classic system of choosing your base and them moving on to flavours, spices and additions! Due to my indecisiveness, choosing one starter out of the eight options proved to be too much. Luckily they had the option of Mixed Entrees ($6.90) which brings you 4 pieces - one Spring Roll, Curry Puff, Chicken Wing and Prawn Get Dressed. 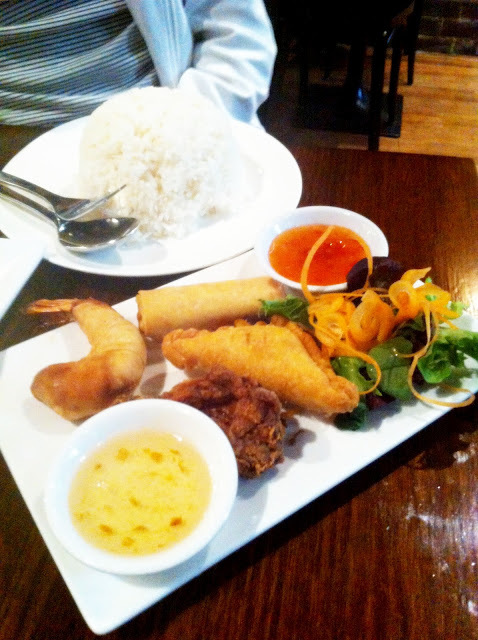 Both the spring roll and chicken wing was standard but the prawn was quite unique! It tasted like prawn wrapped in spring roll paper and fried? Great with the sweet and chilli sauce! 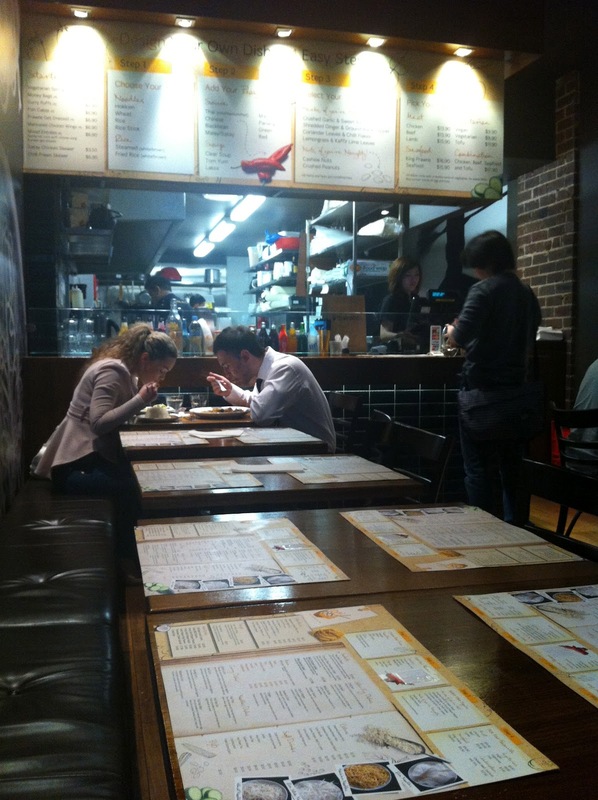 Next, we ordered Seafood Stir-Fry with Chilli Jam, Cashew Nuts & Vegetables ($15.90). To be honest, it was probably a bad idea to order this because most of the vegies were not our favourite and so there was quite a bit left on the plate at the end. Also, there wasn't as much seafood as we had anticipated. Should've went with chicken or something :P Nevertheless, the Chilli Jam sauce was very tasty and delish! Steamed Jasmine Rice came for $2.50. 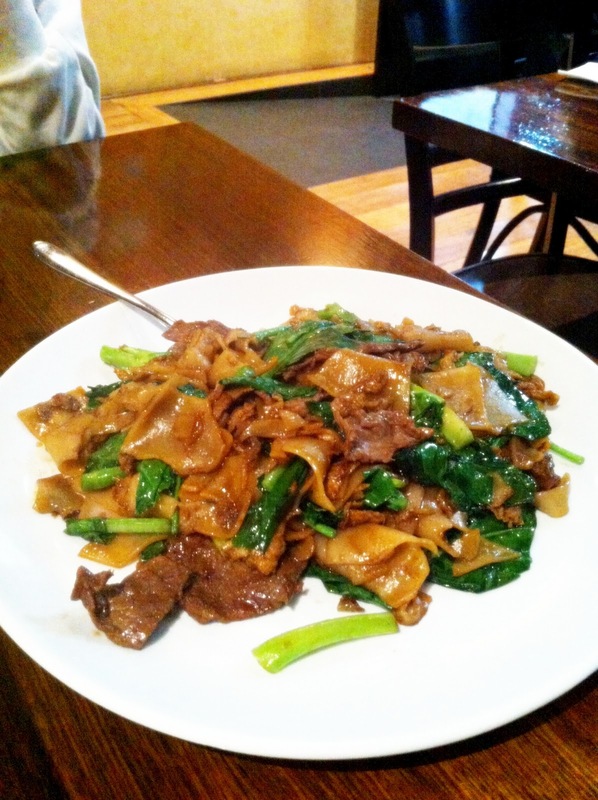 Last but not least, M & I followed our Thai tradition in ordering Pad See Ew with Beef ($13.90) which consists of thick rice noodles stir-fried with chinese broccoli, egg and sweet soy sauce. I don't know if I was just super famished or what, but the first bite was like a step into heaven. The noodles were glossed in that perfect oily shine you'd expect because you know without it, it wouldn't be as fabulous! On the whole, we were quite pleased with our Thai Feast! 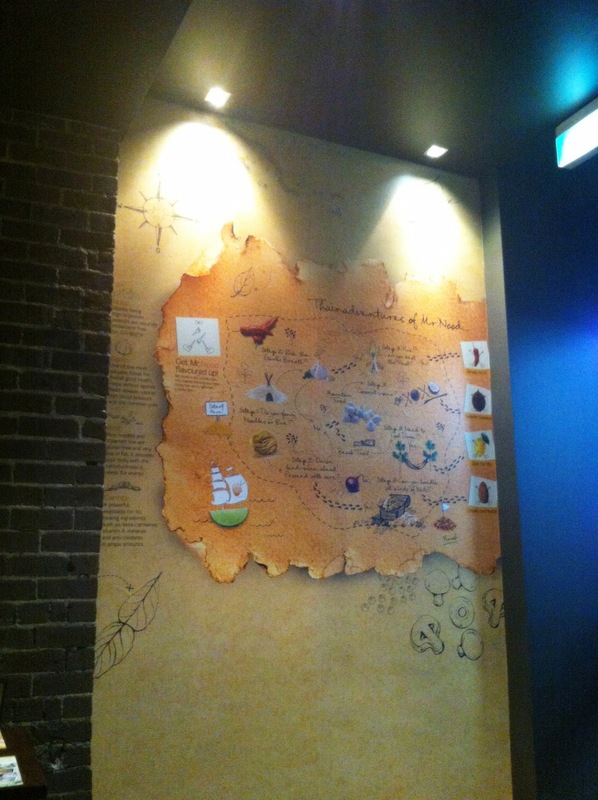 Proportion sizes were good, prices affordable, tasty flavours and fast service. Not bad at all :) Aside from eating in, you can also takeaway and call for delivery. 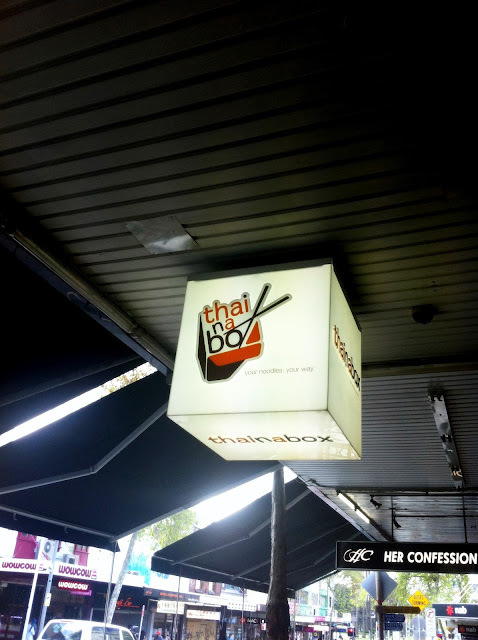 Apart from Burwood, you can also find Thaina Box at Bondi Beach, Neutral Bay, Parramatta and Merrylands.